(Nanowerk News) While lasers were invented in 1960 and are commonly used in many applications, one characteristic of the technology has proven unattainable. No one has been able to create a laser that beams white light. Researchers at Arizona State University have solved the puzzle. 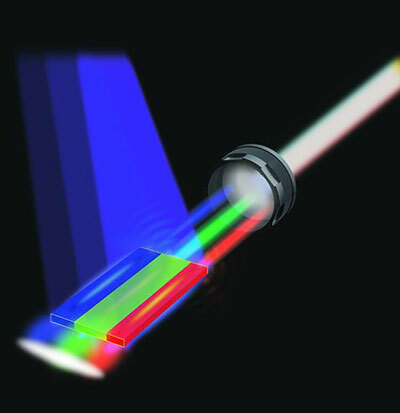 They have proven that semiconductor lasers are capable of emitting over the full visible color spectrum, which is necessary to produce a white laser. The researchers have created a novel nanosheet -- a thin layer of semiconductor that measures roughly one-fifth of the thickness of human hair in size with a thickness that is roughly one-thousandth of the thickness of human hair--with three parallel segments, each supporting laser action in one of three elementary colors. The device is capable of lasing in any visible color, completely tunable from red, green to blue, or any color in between. When the total field is collected, a white color emerges. This schematic illustrates the novel nanosheet with three parallel segments created by the researchers, each supporting laser action in one of three elementary colors. The device is capable of lasing in any visible color, completely tunable from red, green to blue, or any color in between. When the total field is collected, a white color emerges. The researchers, engineers in ASU's Ira A. Fulton Schools of Engineering, published their findings in the July 27 advance online publication of the journal Nature Nanotechnology ("A monolithic white laser"). Cun-Zheng Ning, professor in the School of Electrical, Computer and Energy Engineering, authored the paper with his doctoral students Fan Fan, Sunay Turkdogan, Zhicheng Liu and David Shelhammer. Turkdogan and Liu completed their Ph.Ds. after this research. The technological advance puts lasers one step closer to being a mainstream light source and potential replacement or alternative to light emitting diodes (LEDs). Lasers are brighter, more energy efficient, and can potentially provide more accurate and vivid colors for displays like computer screens and televisions. Ning's group has already shown that their structures could cover as much as 70 percent more colors than the current display industry standard. Another important application could be in the future of visible light communication in which the same room lighting systems could be used for both illumination and communication. The technology under development is called Li-Fi for light-based wireless communication, as opposed to the more prevailing Wi-Fi using radio waves. Li-Fi could be more than 10 times faster than current Wi-Fi, and white laser Li-Fi could be 10 to 100 times faster than LED based Li-Fi currently still under development. "The concept of white lasers first seems counterintuitive because the light from a typical laser contains exactly one color, a specific wavelength of the electromagnetic spectrum, rather than a broad-range of different wavelengths. White light is typically viewed as a complete mixture of all of the wavelengths of the visible spectrum," said Ning, who also spent extended time at Tsinghua University in China during several years of the research. In typical LED-based lighting, a blue LED is coated with phosphor materials to convert a portion of the blue light to green, yellow and red light. This mixture of colored light will be perceived by humans as white light and can therefore be used for general illumination. Sandia National Labs in 2011 produced high-quality white light from four separate large lasers. The researchers showed that the human eye is as comfortable with white light generated by diode lasers as with that produced by LEDs, inspiring others to advance the technology. "While this pioneering proof-of-concept demonstration is impressive, those independent lasers cannot be used for room lighting or in displays," Ning said. "A single tiny piece of semiconductor material emitting laser light in all colors or in white is desired." Semiconductors, usually a solid chemical element or compound arranged into crystals, are widely used for computer chips or for light generation in telecommunication systems. They have interesting optical properties and are used to make lasers and LEDs because they can emit light of a specific color when a voltage is applied to them. The most preferred light emitting material for semiconductors is indium gallium nitride, though other materials such as cadmium sulfide and cadmium selenide also are used for emitting visible colors. The main challenge, the researchers noted, lies in the way light emitting semiconductor materials are grown and how they work to emit light of different colors. Typically a given semiconductor emits light of a single color-- blue, green or red-- that is determined by a unique atomic structure and energy bandgap. The "lattice constant" represents the distance between the atoms. To produce all possible wavelengths in the visible spectral range you need several semiconductors of very different lattice constants and energy bandgaps. "Our goal is to achieve a single semiconductor piece capable of laser operation in the three fundamental lasing colors. The piece should be small enough, so that people can perceive only one overall mixed color, instead of three individual colors," said Fan. "But it was not easy." "The key obstacle is an issue called lattice mismatch, or the lattice constant being too different for the various materials required," Liu said. "We have not been able to grow different semiconductor crystals together in high enough quality, using traditional techniques, if their lattice constants are too different." The most desired solution, according to Ning, would be to have a single semiconductor structure that emits all needed colors. He and his graduate students turned to nanotechnology to achieve their milestone. The key is that at nanometer scale larger mismatches can be better tolerated than in traditional growth techniques for bulk materials. High quality crystals can be grown even with large mismatch of different lattice constants. Recognizing this unique possibility early on, Ning's group started pursuing the distinctive properties of nanomaterials, such as nanowires or nanosheets, more than 10 years ago. He and his students have been researching various nanomaterials to see how far they could push the limit of advantages of nanomaterials to explore the high crystal quality growth of very dissimilar materials. Six years ago, under U.S. Army Research Office funding, they demonstrated that one could indeed grow nanowire materials in a wide range of energy bandgaps so that color tunable lasing from red to green can be achieved on a single substrate of about one centimeter long. Later on they realized simultaneous laser operation in green and red from a single semiconductor nanosheet or nanowires. These achievements triggered Ning's thought to push the envelope further to see if a single white laser is ever possible. Blue, necessary to produce white, proved to be a greater challenge with its wide energy bandgap and very different material properties. "We have struggled for almost two years to grow blue emitting materials in nanosheet form, which is required to demonstrate eventual white lasers, " said Turkdogan, who is now assistant professor at University of Yalova in Turkey. After exhaustive research, the group finally came up with a strategy to create the required shape first, and then convert the materials into the right alloy contents to emit the blue color. Turkdogan said, "To the best of our knowledge, our unique growth strategy is the first demonstration of an interesting growth process called dual ion exchange process that enabled the needed structure." This strategy of decoupling structural shapes and composition represents a major change of strategy and an important breakthrough that finally made it possible to grow a single piece of structure containing three segments of different semiconductors emitting all needed colors and the white lasers possible. Turkdogan said that, "this is not the case, typically, in the material growth where shapes and compositions are achieved simultaneously." While this first proof of concept is important, significant obstacles remain to make such white lasers applicable for real-life lighting or display applications. One of crucial next steps is to achieve the similar white lasers under the drive of a battery. For the present demonstration, the researchers had to use a laser light to pump electrons to emit light. This experimental effort demonstrates the key first material requirement and will lay the groundwork for the eventual white lasers under electrical operation.